It is a Janya raga, derived from Harikambhoji (below), 28th in the Melakarta scale. 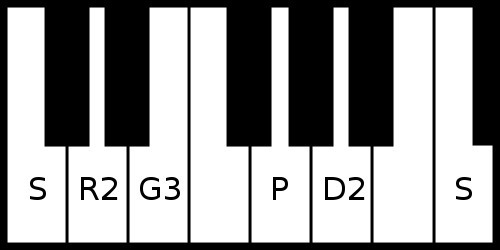 This is a common Pentatonic scale present in music from different parts of the world and is thought to be one of the oldest ragas. The Hindustani equivalent is Bhopali. Appropriately named Mohanam, it is a very pleasing raga and very popular in concerts. It is considered to be best sung at night though of course it is sung at all times. There are many compositions set to this beautiful raga. Some examples are Nannu Palimpa and Evarura Ninnuvina by Tyagaraja, Kapali by Papanasam Sivan, Rara Rajeevalochana by Mysore Vasudevachar and Swagatham Krishna by Oothukadu Venkata Subbaiyer. Not to forget Ninnukori varnam by Poochi Srinivasa Iyengar. Tamil speaking viewers may be interested in Charulata Mani’s Isai Payanam episode featuring Mohanam.